We have locations all over Northern California. From here in Sacramento, to the San Joaquin Valley, to the Bay Area and many cities in between. You can see all of our locations here. This means that meeting with our experts for a free consultation costs you less time and money. 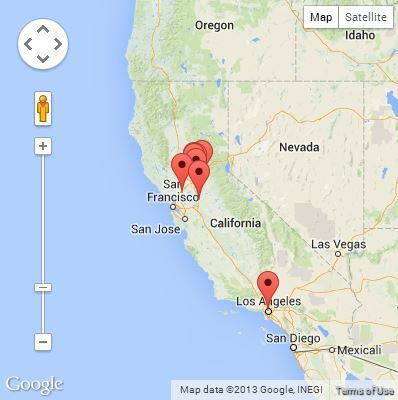 No matter where in Northern California you are, our bankruptcy law firm has a location near you. Additionally, there is power in numbers. Over the years of service to our community we have built relationships with community leaders, attorneys, trustees, and judges. Our reputation for professionalism and relationships help us get your petition through confidently and quickly. Meaning your chances of a successful bankruptcy petition are higher. Finally, being the biggest bankruptcy law firm in Northern California means we have specific knowledge of the issues and struggles facing the communities we serve. We do not observe the consequences of the economic downturn from afar. Our bankruptcy attorneys have seen the damage financial ruin causes, and that is why we are dedicated to working tirelessly to earn you the fresh start you deserve. Citrus Heights, like many communities throughout California, is on a slow but persistent path toward recovery. Foreclosures and other bank initiated collections activities are declining. All this is good news for our clients and other individuals, families, and businesses who have been struggling through the years since the financial meltdown of 2007/2008. However, for many the economic recovery has been tempered at best, and for some it hasn’t come at all. According to the US Census Bureau the average yearly income for Citrus Heights residents is just over $25,000, which is $4000 less than the California average. Additionally the poverty rate is currently at 12.8% while unemployment is set at 8.4%, which is half a percent higher than California at large. This isn’t meant to get you down, but rather to help lend some context to the financial struggles many of your community members are still attempting to overcome. All the down news on the economic situation in Citrus Heights really only means one thing: it would benefit those struggling with debt to learn how bankruptcy attorneys are helping people in Citrus Heights, CA. Our firm has been in the business of doing just that for over 5 years, and our certified specialist bankruptcy attorneys helping people in Citrus Heights, CA just like you. Filing for bankruptcy can be complicated, time consuming, and stressful. Those who choose to file for themselves are often bogged down with paperwork, added filings, court dates, and demands made on behalf of judges and/or trustees. Even lesser experienced attorneys have been known to make mistakes that have resulted in the unsuccessful discharge of a bankruptcy petition. This could be the difference between you keeping your house or seeing it foreclosed on by the lender. There are certain firms who stand above the others for their having studied in-depth the process, law, and strategy that inform bankruptcy in Sacramento, CA. What does it mean to be a certified bankruptcy “specialist?” There are literally dozens of attorneys in the Sacramento area, all of whom refer to themselves as “experts,” “pros,” or “highly qualified.” Only a select few have been awarded the title of certified bankruptcy specialist in Sacramento, CA, and Anthony Hughes is at the forefront of this exclusive group. To become a certified specialist is to have been certified by the American Board of Certification, “the nation’s premier legal specialty certification organization,” as “specialists in business bankruptcy, consumer bankruptcy and creditors’ rights law.” There are only three certified bankruptcy specialists in Sacramento, CA, and The Law Offices of Gabriel Liberman has earned a reputation as the best. Following the financial crisis of 2007/2008, Stockton was particularly hard hit by the sub-prime mortgage scandal and the consequent loss of employment and shrinking consumer base. There is no single reason why hardworking individuals and families have found themselves in difficult financial situations. Similarly, there is not single reason why Stocktonians have chosen to file for the benefits and protections afforded under bankruptcy. What has made bankruptcy in Stockton so appealing to the community and indeed to the city itself? As long as you are under the protection of bankruptcy, none of these can legally take place. If a creditor does try to pursue collections during this period, alert your attorney immediately. Many individuals, families, and businesses are stuck in a bill-to-bill cycle wherein a single unforeseen expense could put them in ruin. Under these circumstances there is no way to build savings. During the course of your petition for bankruptcy in Stockton, many of your debts will be discharged altogether (in the case of chapter 7) or reorganized into a smaller, more manageable monthly payment (chapters 11 & 13). What this means is that for the first time since your financial troubles began, you can begin to build your savings back up, putting you in black and helping ensure you stay out of debt into the future. The financial crash of 2008 facilitated many changes in our financial and legal landscape. One of these changes was the vastly increased need for bankruptcy attorneys in Sacramento and across California. Fortunately, many well qualified and trustworthy attorneys have come forward to meet the needs of individuals, families, and businesses in need. However, while there are many expertly trained and highly experienced attorneys throughout the Sacramento region, there are just as many who are not worth the paper on which their law degree is printed. For the benefit of consumers in the greater Sacramento area, below is a compilation of the best Bankruptcy Attorneys in Sacramento. What does it mean to be a California Board Certified bankruptcy Attorney in Sacramento? The American Board of Certification is a non-profit organization of lawyers and legal experts tasked with independently and objectively differentiating between bankruptcy attorneys with special skills and knowledge , and those without. You can find out more about the American Board of Certification here. >Anthony Hughes: Bankruptcy attorney Anthony Hughes is the only consumer bankruptcy board certified bankruptcy attorney in Sacramento. He was admitted to the bar in 2007 and since then has helped over 5000 clients complete successful bankruptcy petitions throughout the state of California. >Trainor Fairbrook: Ms. Fairbanks is a business bankruptcy attorney in Sacramento. She earned her J.D. from McGeorge and was admitted to the bar in 1982. >Donna T. Parkinson: Ms. Parkinson is a business bankruptcy and creditor rights board certified bankruptcy attorney in Sacramento. She earned her J.D. from UC Davis and was admitted to the bar in 1986.